Mariners Latest: The Mariners Have Been Winning Games! The Mariners Have Been Winning Games! Generally, it's not a good idea to mess with a winning streak. I haven't done a post in quite a while and I figured I'd wait and see what happens. Well, we all know what has gone on the last week and a half. The Mariners are 10-1 in the 11 spring training games they've played with the one loss coming in their very first game. 10 wins in a row and okay, it's neat. I've already put my two cents in as far as spring stuff is concerned, but let's just bask in the winning streak, shall we? For those of you lucky enough to either be at home or in a place you could watch television, Monday's game was televised on ROOT Sports for the first time this spring. I was lucky enough to be home, but unlucky enough to sleep right through it. The Mariners beat the Rockies senseless, winning 16-6 in a game they may as well have called in the 4th when Miguel Batista entered to pitch for the Rockies. But who cares about one meaningless game? We'll take a quick look at how some of the guys fighting for a job are doing. First up is Casper Wells. He's had a total of 22 at bats so far this spring, leading the team in that category. As for how he has looked at the plate, I have no idea. Nobody's been able to watch and ascertain whether or not there's anything different at all to even look at. We do know, however, that on Monday against the Rockies he crushed the ball, bringing his average up to .227. The average really doesn't matter though. 22 at bats is enough to tell you that he has gotten 22 at bats. He's also hit for a little power, with 2 doubles, a triple and a home run in those 22 at bats. Not too shabby, but he also hasn't drawn a single walk and struck out 6 times. Carlos Peguero has 2 more walks than Casper Wells. Decisions are usually based not just on the stats, but on how the player looks at the plate, so there's still hope and we all know what Wells is capable of. We'll have to see how the rest of the spring goes and whether or not he can jump an outfielder or two in the depth chart by then. Speaking of Carlos Peguero, I don't get it. I really don't. He's only had 19 at bats and already has more walks than he did in 57 plate appearances in 2012. He's still striking out some, but apparently he's learning how to take a walk. Not only that, he's hit 3 home runs so far, with at least 2 of them being to the opposite field. From his short stints in the majors the last two years, he was a pure pull power hitter. He could hit to the opposite field, but I don't believe he hit any over the fence. I could be wrong though. Spring stats don't exactly provide the proper motivation to go too much in depth yet. Even so, it's something to keep an eye on as Opening Day draws ever closer. Peguero may force management into an interesting dilemma. Justin Smoak is another one to keep an eye on. He ripped the cover off the ball in September last year and some, if not most, of the fans figured it was just a fluke (again) and he'd turn back in to a pumpkin. He still might, but between September and his torrid spring start, a glimmer of hope has begun to emerge from the depths of despair that is the Smoak conundrum. He's not fighting for a job, as Wedge has already stated that, barring a massive catastrophe, Smoak would be their first baseman come Opening Day. Still, it's worth a mention that Smoak is hitting .500 in 16 at bats with a couple of doubles and a pair of homers. Most of the other guys like Morales, Morse, Saunders and Guti are pretty much locks to make the team, so they won't be mentioned in this post. One guy who IS fighting for an outfield spot, along with Wells, is Jason Bay. We all know he's a 34 year old whose best days are behind him, but if he can show signs of life and prove he can be a productive bench bat, if not a part time player, he could end up taking one of those outfield spots. He's 4 for 8 so far this spring with a couple of home runs, so at least we can he can still hit a baseball and actually get it over the fence at times. But it's only 8 at bats and right now, that's not enough to make any kind of an impact either way. He'll probably end up with a bit more playing time, especially when the Mariners play split squad games. Bay will probably be one of the last players cut to give him, and management, enough time to see what he can do. With the pitchers, there really isn't a whole lot to be said yet. The most innings any one pitcher has thrown total so far is 5. That's barely enough to be considered for the win if you're a starter, so looking at their stats would be as close to pointless as you can get. Instead of going in depth, we'll just do some quick notes on a few. 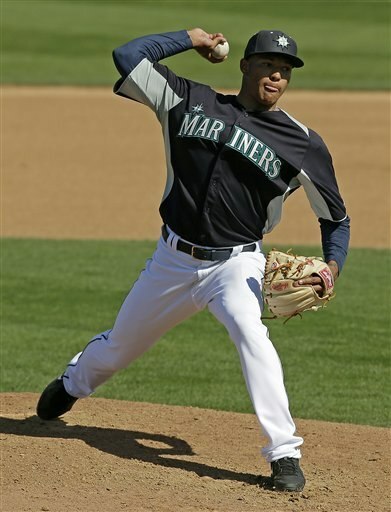 Taijuan Walker is not going to make the team. He's good and will be phenomenal in another year or two, but so far he's looked like what he his: a 20 year old starting pitcher who is still a bit rough around the edges. He has more walks than strikeouts and could use more time in the minors before he's ready. He's a fun guy to watch this spring, but I doubt we'll see him in a big league uniform before September at the earliest. Jeremy Bonderman is attempting a comeback after having been out of the game for a year and a half and the rust is showing. His velocity is still right around 88mph and unfortunately, a baseball is not the same as a DeLorean. The likelihood of him making the team out of spring training are getting slimmer with every appearance, but he's not much more than a stop-gap anyway. If nothing else, I'm sure he'd be much better than the pitcher in the next paragraph. That would be Hector Noesi. He has the stuff to be a decent enough pitcher, but even this spring he's been knocked around every time out. He's still only 26, but the clock is ticking for him already. I know I said I wasn't going to mention stats because it would be next to pointless, but take a look at Noesi's for this spring: 3 Games, 1 Game Started, 3.2 IP, 11 H, 8 R, 5 ER, 6 BB, 4 K. Just let that sink in for a minute. That translates to a WHIP of 4.63. Ouch. I think that may be enough for this week. If any major news pops up or I get bored, I'll be back to write up another post about the Mariners win streak reaching an incredible 16 games or something. A guy can hope. Here's hoping the Mariners winning ways continues throughout the spring on in to the regular season and they remember to pack the offense from Peoria this year. Oh, and if their winning streak gets snapped on Wednesday, it's not because I wrote a post. It was the creepy guy sitting at the corner waving his shirt around like a flag. It's his fault.